“Elemental” damage is a fundamental concept in RPGs: it gets pretty boring pretty quickly if your one attack is equally effective against all targets, so games will typically have several different categories of attack that are differently effective, giving you a slightly more interesting choice to make. In Atlus’ Shin Megami Tensei franchise, exploiting elemental weaknesses is a little too important for my taste – you either do it correctly and win in one turn, or don’t… and give the AI the chance to win in one turn. 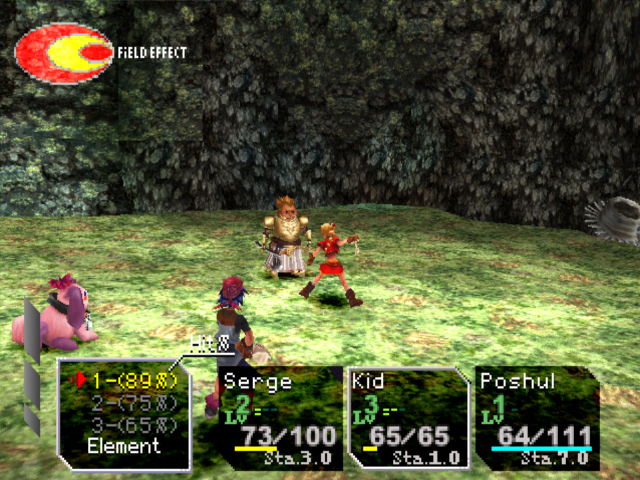 In Chrono Cross, the word Element has a totally other meaning, but the concept of “elemental damage” still exists in the form of colors. And I’m a big fan of how CC uses colors to provide that extra bit of complexity to the decision making process without making it trivial to find the optimal choice. 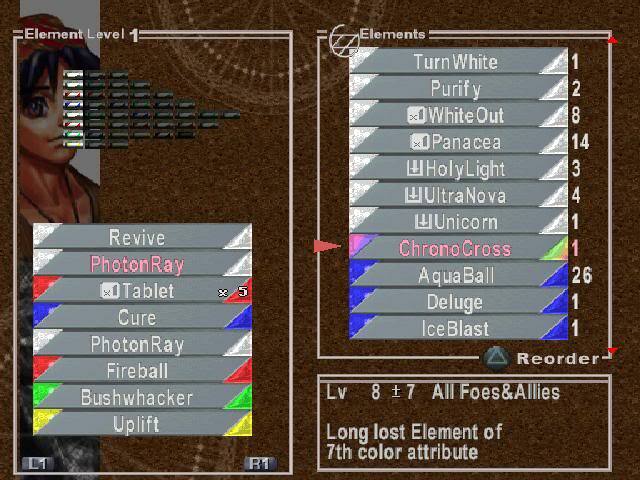 Chrono Cross has six colors… plus one. There are six colors, matched in three pairs of opposite colors: red/blue, green/yellow, and white/black. Every player character and every enemy has an innate color. In general, opposite colors deal more damage to each other while matching colors deal less, and other color combinations do not affect damage. 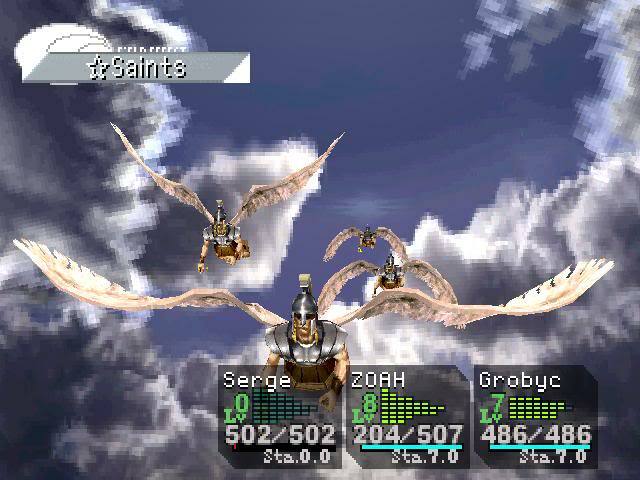 From the Skies of Arcadia manual. For physical attacks, the main considerations are the color of the attacker and target, and how they compare to the Field Effect (F.E.) which is shown in the top left of the battle screen. The F.E. represents the last three Element colors used in the current battle. It starts as a random collection of colors, and using an Element pushes its color into the list and removes the oldest color. The more a character’s color is represented in the F.E., the more effective they will be at dealing damage; conversely, the more the character’s opposite color is represented, the less effective they will be. -1 for each time the attacker’s opposite color appears in the F.E. Additionally, if the target’s color is opposite to the attacker’s, the total damage will be boosted by an additional 50% on top of the result of the point system changes. Therefore a red attacker hitting a blue target with a fully red F.E. will get 4 points and deal 1.5 * 1.5 = 2.25 times their base damage, while a red attacker hitting a red target with a fully blue F.E. will get -3 and a multiplier of 0.665. That’s more than a threefold difference between the best and worst matchups, so choosing who will attack who when is important! The rules governing Element damage are similar in structure but there is an additional complication: each Element has its own color which must also be taken into account. -1 for each time the Element’s opposite color appears in the F.E. Like before, there is a 50% bonus awarded if the Element’s color is opposite to the target’s. The same minimum and maximum multipliers apply, which is advantageous to the attacker, since it is actually possible to score a dismal -5 points if e.g. a red attacker cast a blue Element on a blue target with a fully blue F.E. 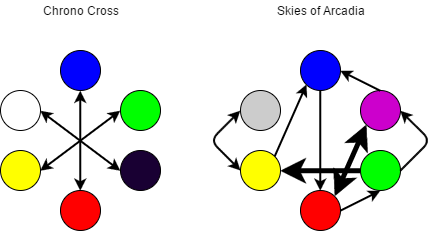 One of the reasons Chrono Cross allows the player to escape any battle at any time, even boss battles, is that the color composition of both your party and each party member’s Element loadout is so important to your effectiveness that you will likely need to rethink your approach based on the color the enemy turns out to be. And it’s for that same reason that the usability issues with the Element equipment interface are so detrimental to the play experience. If the Field Effect is all the same color, it is possible to use a Summon Element, which is a very powerful attack in the vein of Final Fantasy summons. Unlike every other kind of Element, you can only use summons a certain number of times before resting at an inn, and that number is equal to your Growth Level, which increases as you make story progress. This is in my opinion the weirdest thing in the whole weird game, and it isn’t really a mechanic that influences your strategy in a typical battle; in practice, one uses summons almost exclusively as a way of grinding for rare loot. Killing enemies with a summon causes them to drop Shiny items instead of their normal items, and Shinies can be used to forge the best equipment in the game. Outside of this purpose, I never really think about summons. That said, turning the whole Field Effect to one color is pretty useful for non-summon purposes as well. In fact, a set of Elements exists that only turn the F.E. to a uniform color. That such a specialized ability has so much situational utility is one advantage of having so many interrelated core combat mechanics, and in the final part of this series we’ll talk about some of the interesting manipulations that non-damage-dealing Elements like this allow.